Starstruck – a new Australian musical based on award-winning director Gillian Armstrong’s iconic rock musical satire. Designed by Brian Thomson (who designed the film), adapted for stage by Mitchell Butell and produced by Garry McQuinn for RGM Productions, Starstruck onstage will be developed in association with NIDA in Sydney. With its quirky day-glo-colored fun and string of catchy tunes by Australian homegrown talent, the film was (as critic Paul Byrnes described) “somewhere between a celebration of Australiana and an episode of the iconic 1970s TV rock show, Countdown.’ The standout ‘Body and Soul’ became an Australian chart hit, but the other songs like ‘The Monkey in Me’ have become cult classics. 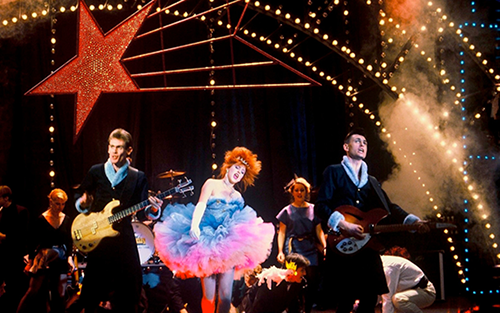 Following the international success of her period piece My Brilliant Career, director Gillian Armstrong veered in a completely new direction with Starstruck, the New Wave musical comedy. Set around the The Rocks around Sydney Harbour, Starstruck tells the story of the loveable and quirky Jackie Mullen. She is destined for stardom and she’s prepared to do anything to get there. Splashy, colorful and naively satirical, producer David Elfick’s film established a new style of Aussie filmmaking now firmly ingrained in the popular consciousness. A new Australian musical based on the 1982 film by Academy award-winning director Gillian Armstrong with initial workshops to be hosted by NIDA in 2018/2019. Designed by Brian Thomson (Jesus Christ Superstar, Rocky Horror Show, Priscilla Queen of the Desert, the Musical and designer of Starstruck the film) adapted for stage by Mitchell Butel and produced by Garry McQuinn for RGM Productions.